I’ve been bitten by the Netrunner bug. It’s a card game, but it’s so much more than that. I’m not going to attempt a review, I just want to gush a little bit about the setting. I played a bit of Cyberpunk back in the day (though I was more of a Shadowrun fan to be honest) and I like the whole dystopian future city idea. And of Blade Runner is a classic. I even played the WotC first run of Netrunner quite a bit. But the new game is all of that turned up to 11. It’s the stories I like, and who knew how many scenes would start popping simply from the notion of hackers trying to break into corporate databases? Last night I played the Weyland Corporation from their space station high above the Beanstalk that connects New Angeles to orbit (cool already right?) My sparring partner Dan was playing the runner, an idealist who helps the disenfranchised stick it to the man. I was trying to tag her so I could burn down all her friends family and property. She was using Itinerant Protesters and Undercover Journalists to rack up Bad Publicity for me. But her hacks ended up stopping my Space Camp program, and that made kids cry. She won in the end by raiding my R&D department and snagging some secret project data I had. What’s incredible is how much you get from just a bit of art, some very occasional flavour text, and the interaction of mechanics. My fave card from last nights game shows you just what I mean. The hacker rides a motorbike, with their computer built in, so I can’t tag her, find out where she lives, and arrange a nasty accident. Awesome. 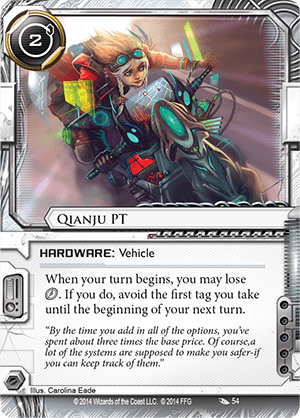 Netrunner has been excellent in revealing their world through art and flavor text. While I miss the old Cyberpunk 2020 chrome of the original version, FFG’s version is 100% more playable.